Traditional techniques, developed to solve woodworking problems unique to vernacular boatbuilding, are taught in this hands-on workshop. Participants work as a team to construct a twelve to fourteen-foot version of a traditional “rack of eye” flat-bottomed skiff. In the process they learn how to set up the boat, spile and bend planks, plane bevels, erect framing, and explore fastening options and the characteristics of traditional boatbuilding woods. 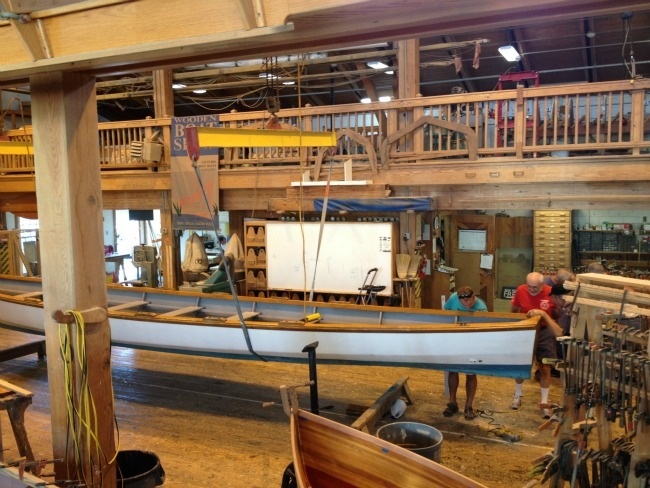 12 hours (2 day class) can be used as a prerequisite for 9 Day Boatbuilding. Class: March 15-16, 2014 from 9 a.m. to 4:30 p.m. Class Fee: $135. Friends of the Maritime Museum receive a discount. Reservations required. Additional 2014 class dates include: May 17-18, August 23-24 and November 8-9.